Russia is mainly a northern country with long-lasting cold winter. Obviously the food should give much energy and warmth to survive during the winter time to Russian peoples. So, the essential components of Russian cuisine are the ones, which provide more carbohydrates and fat rather than proteins. Fresh fruits and vegetables are rarely used in food. So, the top five components of a Russian meal are potatoes, bread, eggs, meat (especially beef) and butter. Other popular foods include cabbage, milk, sour cream, curds, mushrooms, lard, cucumbers, tomatoes, apples, berries, honey, sugar, salt, garlic, and onions.Blini, or Russian pancakes, are thin, flat cakes prepared from batter and cooked on a hot frying pan - first on one side and then flipped to cook on the other side. The origins of this traditional Russian dish, which recently celebrated its thousandth birthday, can be traced back to ancient times. Its ancestor was made from oat jelly; a hungry traveler wishing to warm the composition up on the fire probably got distracted by something very amusing, leaving the jelly to fry and thus creating the first blini.Since then blini have changed, but not dramatically they are now made not only from oats but also wheat, rye, buckwheat and barley. In pagan times blini were made for Maslenitsa, also known as “Butter Week,” “Pancake Week” or “Cheese Fare Week.” It was and still is celebrated during the last week before the Great Lent. Maslenitsa was a sun festival, celebrating the imminent end of winter and the coming of spring. It lasted for a week, during which time people tended to eat nothing but pancakes. The blin itself, round and golden, symbolized the sun.For this month's International Food Challenge ,a monthly event started by wonderful food blogger Sara,we are landing towards Russian Cuisine. 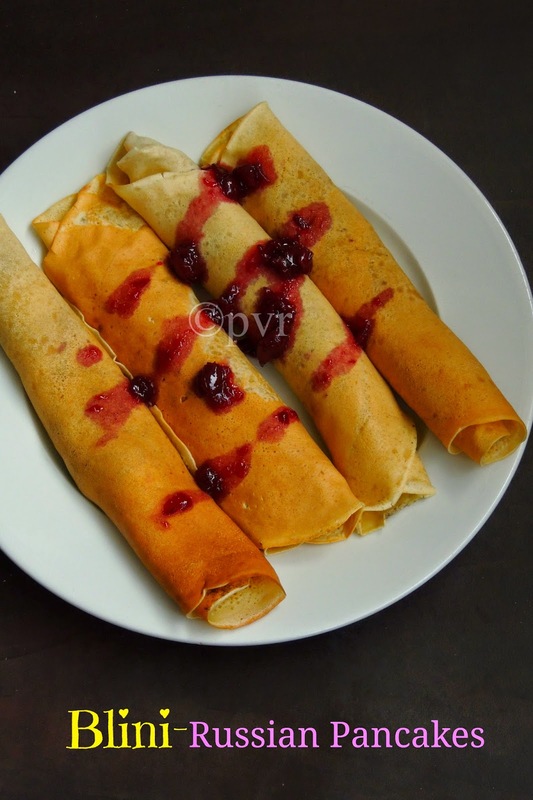 And i picked Blini, the famous Russian pancakes from the recipes suggested by Saraswathi. These blinis are dangerously addictive and we enjoyed thoroughly for our evening snacks. Beat together the milk and the eggs, add in the salt and the sugar and mix well. Add the baking soda and citric acid. Melt a tablespoon of butter in a small frying pan over medium-high heat. Pour in a ladleful of batter, tilt the pan so the batter makes a circle and coats the bottom. The blini should be very thin. Return the pan to the heat. Cook the blini for 90 seconds. Carefully lift up an edge of the blini to see if it's fully cooked. The edges will be golden and it should have brown spots on the surface. Flip the blini over and cook the other side for 1 minute. Transfer the blini to a plate lined with a clean kitchen towel. Continue cooking the blini, adding an additional tablespoon of butter to the pan after each 4 blini. Stack them on top of each other and cover with the kitchen towel to keep warm. Spread your favorite filling in the center of the blini,roll it. 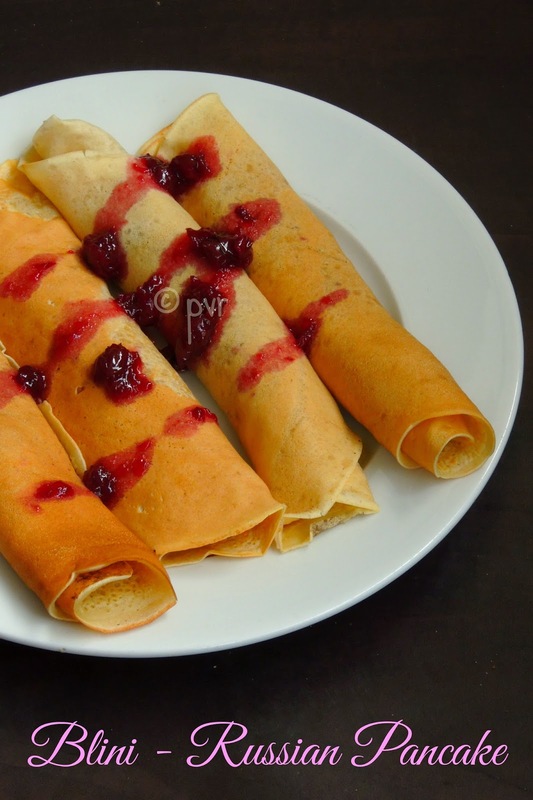 Russian Pancakes looks amazing.I can happily have these pan cakes for breakfast any day. Looks interesting and delicious ! These pancakes look too delish.. Feel tempted looking at the pic. G'day Your blini look delish Priya! Seriousely they are addictive Priya ji. After seeing your pictures, My son wants to eat it right away...Kids really enjoyed it..